I went to a Halloween Party today with Gavin, so it was fun getting him in his costume. He thought it was pretty fun, and seemed to like wearing it. He didn't like the hat though, so that was off the whole time. We took advantage of the beautiful weather, and I got some pictures with him outside. We had fun last night carving pumpkins at Autumn and Doug's. I didn't think Gavin would really be interested, but he LOVED it. He would get right on the table and try to help me. He was so entertained. This is Braxton and his pumpkin. He keeps saying the pumpkin is him. I said, "yep, the pumpkin does look like you." and he said, "no, it IS me.". Trying to eat some pumpkin...yuck. Our cute little pumpkin. The finished pumpkins and their proud carvers. Gavin loves to wear my shoes. He really like these pair of shoes because they are easy to slip on and he can walk around in them. As my father-in-law, Floyd, would say, Gavin looks fairy nice in them. Just what we thought! 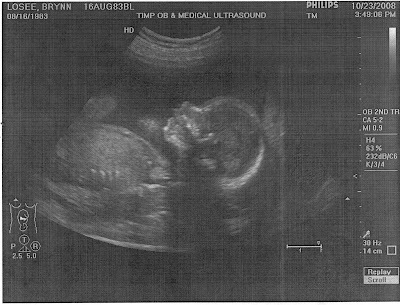 We weren't too surprised to find out we're having a boy...but it is nice to know for sure. Gavin is going to have a little brother, and he is going to show him how to get into all sorts of trouble. 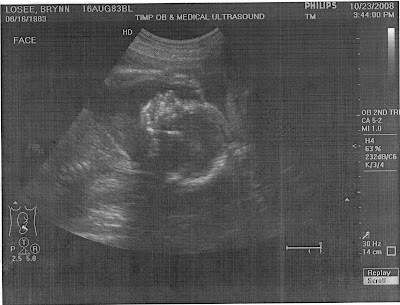 Here are a couple ultrasound pictures...can't see much, but I love the first one. His hand is up by his head and he is pointing to his head. I loved being able to see his little fingers. I have hit the halfway point! When I was pregnant with Gavin, I didn't have any pictures being pregnant, so with this pregnancy, I am going to try to take more pictures. I broke out the maternity clothes yesterday, and so now I can start looking pregnant instead of looking like I have a gut! Casey's sister gave me all her maternity clothes, so I feel like I have a whole new wardrobe! My favorite part is the stretchy pants. They are so comfortable! We find out what we are having this week...yay! After traveling all day (in the snow storm) last Saturday, we got to our condo, and they didn't have our room ready, so we decided to run to "In and Out Burger" for dinner. These pictures are for Doug...we are trying to show him what he missed out on. Gavin loves his fries and ketchup! We stayed at Tahiti Villiage, a resort at the southern end of the Vegas Strip. We spent one day in a tiny unit that had only a half kitchen, so after pulling a few strings, we got moved into this bigger room, with a full kitchen, big screen TV and the kid's favorite part...the jetted tub! We are so glad Gavin has Braxton. While we were busy watching the first season of "Heros" (our new favorite show), Braxton and Gavin would play or watch movies. Gavin usually sat for 2 minutes, and then he was off doing something...or getting into something. We went down to the strip a couple of days while we were there. Our resort had a shuttle that would take us to different parts of the strip. Gavin thought it was so fun to ride the bus and look out the window. We had a lot of fun at the Mirage. They have a huge aquarium where they have dolphins. We watched them do some training and feeding with the dolphins. This was Gavin's favorite part of the trip. He got so mad at me when we finally had to leave the dolphins. I couldn't get a picture with him looking at the camera because he was to entertained watching the dolphins, lions and tigers. We went to Ceasers Palace and ate at the Cheesecake Factory. The boys loved looking at the fish that were swimming in the huge aquarium right outside the Cheesecake Factory. Gavin would see a fish he liked and would run along the side trying to keep up with it as it swam by. Everytime we go to Vegas, we have to stop at the Bellagio to see the conservatory and the fountains. We haven't ever been there in the fall, and it was beautiful in the conservatory with the fall colors. The resort we stayed at had a nice pool. Part of it was a sandy beach. Gavin loved playing in the sand. It was really warm there, so the cool water felt really nice. I had to put this picture in...to show Casey really was here. He had two big assignments due for school, so he spent a lot of time on the computer working on them. He was such a good sport to come on this trip with two sisters, and two crazy boys! We were just a block away from the Outlet Stores, so Autumn and I were in heaven! We got the boys these cute outfits, and had to take their pictures and take advantage of the beautiful scenery. Aah...almost home. We stopped off to pick up the dogs at Floyd and Barbara's. They were so nice to take all 3 dogs. Gavin was so excited to see Emma. He couldn't stop hugging and picking her up. We had a great time, but we are glad to be home! Gavin turned 18 months today! We sure love this little guy. Everyday there is something new and funny he does. He is talking a lot now, but you'll need Casey and I there to interpret what he is actually saying. The words he says really good are: mom, dad, Emma, uh oh, no, juice, cheese, hi, bye and kitty kitty. We love you so much Gavin!